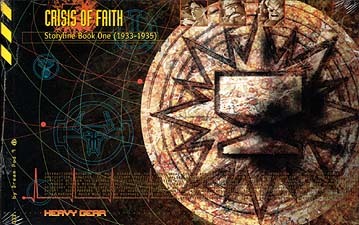 Storyline Book One: Crisis of Faith traces the events on Terra Nova from TN1933 through TN1935. The planet lurches toward a global conflict and the words of Terranovans themselves betray their machinations and true intentions. Dramatic events that were only hinted at in previous books start to take form with world-shaking consequences. Letters, private conversations, journal entries and official reports expose the true face of history, from the deadly secrets of master spies to the fears of those caught up in a conflict beyond their control. Terra Nova grows older and more mature, but at the cost of the precious innocence and peace won at the end of the War of the Alliance.